NASHUA, N.H. - Andrew Vaughn tallied two hits and drove in the go-ahead run, while Jake McCarthy collected two hits and Patrick Raby tossed 3.2 scoreless innings as the USA Baseball Collegiate National Team clinched the series victory over Japan with a 3-1 win on Monday in the final game of the 41st USA vs. Japan Collegiate All-Star Series from Holman Stadium. The series against Japan is sanctioned by the World Baseball Softball Confederation. The U.S. won the best-of-five series, 3-2, and is now 23-18 all-time against Japan over the 41 series played between the two teams. Vaughn was named the series MVP after hitting .333 with two doubles and two RBIs, including the game-winning run to clinch the series for the U.S. Japan's Taishi Kusumoto earned Batting Champion with a .389 batting average with a .476 on-base percentage, while Katsuki Azuma was selected as the Pitcher of the Series after throwing 11 scoreless innings over two starts with 18 strikeouts. Daiki Sakamoto was presented with the Spirit Award. With the score tied 1-1 in the sixth inning, the United States scored two runs to take the 3-1 advantage. Vaughn hit a line drive off the center-field wall for a RBI-double to bring home Steele Walker and later crossed home on a fielding error by Japan. Japan scored the first run of the game as it capitalized on a U.S. throwing error in the top of the first inning, but the United States tied the game in the bottom of the third inning. McCarthy hit a line drive to right-center field for a double and scored on a Nick Madrigal single to right field. Raby earned his third win of the summer throwing 3.2 shutout innings out of the bullpen with four strikeouts. Starter Tyler Holton went 4.0 innings allowing one unearned run on three hits with four strikeouts. Dallas Woolfolk picked up his fourth save with a scoreless ninth inning with two punch outs. The U.S. team ended the game with three runs on five hits with one error, while Japan finished with one run on six hits and one error. 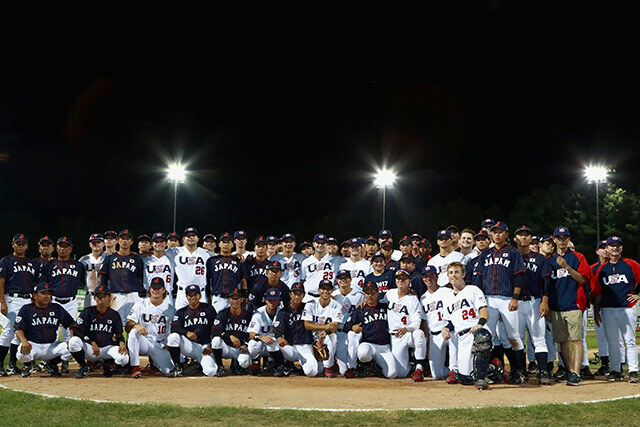 Immediately preceding the US vs Japan Series, the Team USA beat Chinese Taipei four in a row, and won three of five against Cuba at the exhibition games.